The IRS begins filing returns on January 28, 2019. If you have already filed your tax returns, be it via mail or e-filing, you will not receive a refund until this date. For those whose filings include the Additional Child Tax Credit or Earned Income Tax Credit, the IRS issued a special memorandum titled “Refund Timing For Earned Income Tax Credit And Additional Child Tax Credit Filers” that states the IRS will provide new official guidance on February 23, 2019 and that no taxpayer whose filing includes one of these credits will be processed for direct deposit payment until February 27, 2019. If you e-file your tax payment on January 28, 2019 or later, and you do not claim the additional child tax credit or the earned income tax credit, and you are eligible for a refund, then you should expect for the IRS to begin processing your payment within 24 hours of filing (if on a business day) and you will typically receive your tax refund via direct deposition within eight to fifteen days if receive this refund payment option. Last year, the IRS processed over 90% of tax refunds within 21 days of receipt. If you mail in your tax your payment, the processing will take about 4-6 weeks for a check to issue. If you want to receive a tax refund promptly, you should e-file rather than mail in your payment, as you will receive your refund almost a month earlier. Also, paper check filings require the manual involvement of an IRS employee, and since only a little more than half of the IRS is working during the government shutdown, the traditional expectation of a month for a refund to issue might take longer. If you want to check the status of your IRS tax refund, the IRS encourages you to download the IRS2Go mobile app to check on the status of your refund. In order to use the app, you will need to provide your social security or EIN number, your filing status, and your exact refund amount in order to create an account and access the app. As of last year, the average amount of a federal tax return refund in the United States was $2,895. Maine residents had the lowest at $2,302, and Texas residents had the highest at $3,133. You should make sure that you enter the information accurately and do not modify or omit anything you encounter on your W-2 forms. If there is any disparity between what you report to the IRS and what your employer reports to the IRS about you, this could results in extended processing times and could even bar the issuance of a tax refund altogether and could increase the odds of an audit. Even though the government is currently shut down, the Office of Management and Budget revised 2011 guidance for IRS employee expectations during the government shutdown to state that furloughed IRS workers can process refunds during a shutdown. As of now, approximately 36,000 of the more than 50,000 IRS employees are working (currently without pay). If you are not worried about the filing deadline, but just want to make sure you that get your taxes in on time, you have until Monday, April 15, 2019 to submit your 2018 tax returns. If you live in Maine or Massachusetts, where the Patriots’ Day holiday is celebrated on April 15, 2019, your taxes will receive a brief extension to accommodate the holiday. 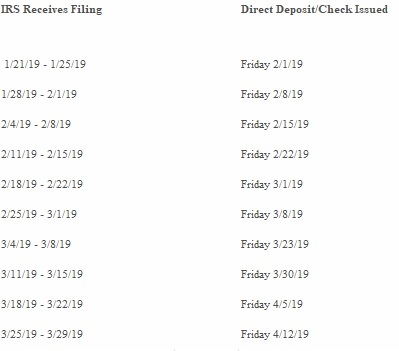 I have attached the enclosed chart of my estimates for when you should receive your tax refund based upon the date that the IRS receives your filing. You should note that these are just estimates, and not something that the IRS guarantees or promises. Further, you should note that “peak tax season” occurs during late March and the first week of April, and if you are filing during this time, you should be prepared for an additional week or so delay to the high volume of filings. This chart provides some estimates for when you should expect to receive your IRS tax refunds in 2019 for any excess payments you may have made on your 2018 taxes. In short, once the January 28, 2019 date of initial IRS tax receipt processing commences, you should expect to receive payment with 2-3 weeks if you e-file, but you will have to wait until late February if you claim the earned income child tax credit or additional child tax credit, and if you mail in your tax payments, you will have to wait at least a month, but possibly longer, as this requires IRS review and almost half the IRS is not working due to the furlough. If time is of the essence for receiving your payment, and you do not claim the above-mentioned tax credits, then you should expect to have direct deposit sent within a week or two, and if you elect for a paper check payment, you will have to wait three to five weeks.